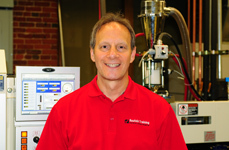 Routsis Training is the premier training provider for the plastics industry. Built on 30 years of plastics training success, our comprehensive programs and services combine the best attributes of traditional one-to-one training with a powerful online portal that's accessible anytime. Routsis products deliver real-world learning that covers injection molding, extrusion, blow molding and decoupled molding, as well as part and mold design, machine maintenance and more.